In Psalm 8 the writer meditates on the vastness of the created order and he recognizes his smallness in light of the grandeur of the universe. This leads him into a deeper expression of praise of the living God. Not everyone who contemplates the cosmos enters into such worship. Rather, there are some who look at the bigness of the universe and conclude there must be no God at all! Recently some philosophers have attempted to formulate this idea into an argument against the existence of God. "Over the last few decades, a new way of arguing for atheism has emerged. 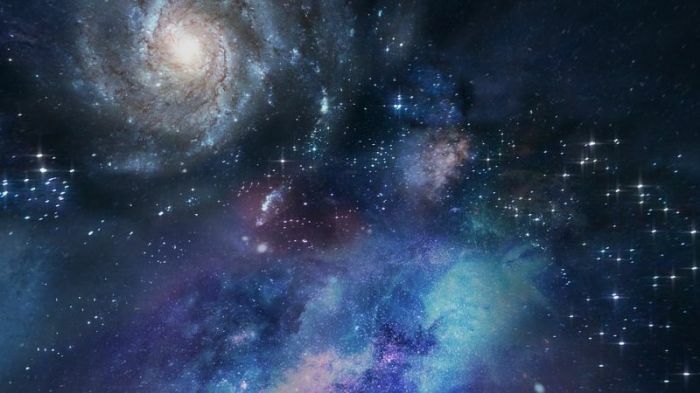 Philosophers of religion such as Michael Martin and Nicholas Everitt have asked us to consider the kind of universe we would expect the Christian God to have created, and compare it with the universe we actually live in. They argue there is a mismatch. Everitt focuses on how big the universe is, and argues this gives us reason to believe the God of classical Christianity doesn't exist. "To explain why, we need a little theology. Traditionally, the Christian God is held to be deeply concerned with human beings. Genesis (1:27) states: "God created mankind in his own image." Psalms (8:1-5) says: "O Lord ... What is man that You take thought of him ... Yet You have made him a little lower than God, And You crown him with glory and majesty!" And, of course, John (3:16) explains God gave humans his son out of love for us. "These texts show that God is human-oriented: human beings are like God, and he values us highly. Although we're focusing on Christianity, these claims can be found in other monotheistic religions, too. "If God is human-oriented, wouldn't you expect him to create a universe in which humans feature prominently? You'd expect humans to occupy most of the universe, existing across time. Yet that isn't the kind of universe we live in. Humans are very small, and space, as Douglas Adams once put it, "is big, really really big". "Clearly, there is a discrepancy between the kind of universe we would expect a human-oriented God to create, and the universe we live in. How can we explain it? Surely the simplest explanation is that God doesn't exist. The spatial and temporal size of the universe gives us reason to be atheists. "The findings of modern science significantly reduce the probability that theism is true, because the universe is turning out to be very unlike the sort of universe which we would have expected, had theism been true." Note that the argument seeks to posit a tension between the Christian worldview and the state of the world (i.e., the empirical facts regarding its size). In light of this it is important to recognize that the argument needs to take into account the full resources of the Christian worldview and accurately note the relevant background features that impinge upon the discussion. This is something the argument, at least as so far formulated, does not do. The argument cites three Scriptural texts: Genesis 1.27; Psalm 8.1-5; John 3.16. From this set of references it concludes: "These texts show that God is human-oriented." But this conclusion is not strong enough to generate the problems and tensions alleged in the argument. In order for the argument to work the premise needs to be strengthened to the following: "These texts show that God is merely or only human-oriented." Without this change to the premise the argument will not work effectively. The texts cited do show God has a human-orientation; he does value humanity. But there are other orientations and perspectives that God has that also have relevance to the size of the universe. <sup>4Where were you when I laid the foundation of the earth? Tell me if you have understanding, <sup>5who set its measurements? Since you know. Or who stretched the line on it? <sup>6On what were its bases sunk? Or who laid its cornerstone, <sup>7when the morning stars sang together and all the sons of God shouted for joy? "All the angels had evidently been created before the universe. And it is not hard to see why. God meant there to be an audience when he created the world. I am sure he said, "Watch this!" when he spoke the galaxies into existence. Imagine the awe and wonder that exploded among the angels. They had never seen or even imagined matter. They are all "ministering spirits" (Hebrews 1:14) and have no material bodies as we do. When God brought material stuff into existence with all its incredible variety and utterly unheard of qualities of sight and sound and smell and touch and taste, this was totally unknown to the angels. God had made it all up. It was not like the unveiling of a new painting made of all the colors and paints we are all familiar with. It was absolutely, totally, unimaginably new! And the response of the sons of God was to shout for joy." Although this text does not mention the creation of the physical universe, as did the passage from Job, it does show God's purposes encompass more than humanity. This serves to undermine the argument under consideration. "One odd feature of much contemporary philosophy of religion is that it seems to portray God as having a 'personality' that is almost entirely empty, allowing his behavior to be almost exhaustively determined by facts about how it would be best for others for an omnipotent being to behave. But why should we grant this portrayal, or anything like it? God is supposed to be a person not only of unsurpassable love and goodness, but of unsurpassable beauty. And it is not at all clear that God could be that sort of person if the portrayal of God as (effectively) a cosmic, others-oriented utility-maximizing machine were correct. For it is hard to see how a person could manage to be unsurpassably beautiful, or even very beautiful at all, without having a highly complex personality and motivational structure." Since God is pursuing the manifestation of his glory it is entirely plausible that God would create a massive universe so that the proportion of the universe relative to humanity is of such a magnitude as to highlight the extremity of his glory. Continuing with the above it is interesting to consider the apostle Paul's argument in Romans chapter one. Paul's argument is that the created order reveals something of God's character—"his eternal power and divine nature." This knowledge of God is of such clarity that it renders all those who experience it as being in a state of "without excuse" for refusing to worship God and give him thanks. Since the created order reveals attributes of God and renders humanity inexcusable then when there is a greater depth of understanding of this created order this reveals more of his character. When this is combined with the traditional understanding of God's omniscience as including all future realities there becomes a plausible reason why God would create such a massive universe. As future generations came to understand the depths of the created order—both its expansive magnitude and its microscopic intricacy—this would actually reveal more of the character of God and thus render humanity all the more inexcusable for failing to respond rightly to this revelation. In short, God creates a massive universe with a view to the future when humanity has the tools and insight to become aware of its magnitude so as to progressively reveal the depths of his character. But in light of the analysis above Everitt's argument is without substance. The probability of theism in light of the size of the universe can only be properly assessed when all the relevant background features are taken into account. This is something the above argument does not do. The argument selectively cites Scripture and ignores key elements of the Christian worldview that would affect the nature of the probability under discussion. Perhaps the argument can be reformulated to take into account these criticisms but as it stands now the argument is fundamentally flawed. Richard Klaus is a graduate of Phoenix Seminary and is currently the Ratio Christi Chapter Director for the campus of Glendale Community College (AZ). He blogs at White Rose Review.